Find out how to make money publishing to Google Street View on WGAN-TV Live - at a special time 1 pm ET (GMT -4) for this show - on Tuesday, 10 July 2018. Our guest will be Discover Africa Group Director Andre Van Kets (whom presented at the 2018 Google Street View Summit in Mountain View, CA in May 2018. Discover Africa Group took the lead to map all 19 South Africa National Parks (170 trails) using the Google Trekker in 2016. Discover Africa Group worked closely with South African Tourism, South Africa's official tourism site. Now that there are many 360º 1-click camera solutions - including the NCTech iSTAR Pulsar - for easily capturing reality and publishing to Google Street View, it's time to seriously consider how to make money publishing to Google Street View. And, while Discover Africa Group did not make cash directly from publishing to Google Street View, there are at least a dozen different ways this project help lead to new business for this South Africa based agency. You can watch the two videos (below) to get an overview of exactly what Discover Africa Group championed in South Africa. 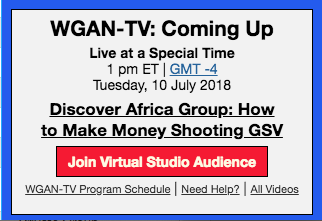 On WGAN-TV, we will focus on how Discover Africa Group made/makes money publishing to Google Street View. Discover Africa Group capturing and publish South Africa to Google Street View is a great Case Study that will help inspire you to think big: how to charge by the mile instead of the square foot. There are so many ways to make money publishing to Google Street View and in this show we will focus on the benefits of capturing local, state and national parks (and more) - for free - and then publishing this content to Google Street View for free - to make money. ✓ Discover Africa - For the luxury traveler looking for the ultimate African experience. Discover Africa makes sure you don’t miss a thing and come back relaxed at the same time. Every traveler's dream. ✓ Drive South Africa - For the adventure seeker eager to travel Africa on their own steam. Drive South Africa has 14 years of car, 4×4 and camper experience making sure you get there with experience and reliability at your back. ✓ Overlanding Africa - Overlanding means activities and groups and a lot of fun. Perfect for the 20-35 year old looking to explore Africa the ground up. Packed with adventure, experiences and friends. Andre is co-founder and IT Director of Discover Africa Group. Andre heads up Web Development, Search and Online Marketing. Andre has been working in the online travel industry since 2002. Nelson Mandela Capture Site - a tourist site that marks the spot where former president Nelson Mandela was captured prior to serving 27-years in prison. "The Chainladders" an infamous hike in South Africa's largest mountain range: The Drakensberg (meaning: Dragon's Mountain). A lovely walk through the Harold Porter Botanical Gardens. Visit an Elephant Graveyard in the Kruger National Park. Can you spot the Elephant on the dry river bed in the distance. This moment from a multi-day wilderness trail in the Kruger National Park. See the Big Five on foot. Marvel at ancient rock art painted by local tribes approximately 10,000 years ago in an area known today as "The Cederberg". Walk across a suspension bridge in the green and lush Garden Route National Park. The "Otter Trail" is a five day hike that spans covers 42km. It is one of the most exciting and sought-after hikes to do, with limited numbers allows each year and a 12-month waiting list. Now you can explore every inch of this trail on Street View. Can you see the Cheetah crouched under the bush. Walking in the wild with Cheetah and other big game are some of the bucket list activities one can do in South Africa's national parks (with qualified guides of course). This experience from the Mountain Zebra National Park. Can't wait to join the studio audience on July 10! Hope you can make the show today. Please note special time ... 1 pm ET today, Tuesday, 10 July 2018. Find out how to make money publishing to Google Street View on WGAN-TV Live - at a special time 1 pm ET (GMT -4) for this show - on today, Tuesday, 10 July 2018. Watching the stream . Can't figure out how to join the audience on mobile. Boo! Thanks to Discover Africa Group Co-Founder @AndreVanKets for showing us how to make money publishing to Google Street View in some unexpected ways. Congratulations, you have passed the Mensa International test. You will receive your certificate shortly.